One of my favorite memories from this past New York Fashion Week: Men's is sitting front row at the Grungy Gentlemen fashion show. It was fabulous and not just because I'm a huge Jim Jones fan and he opened the show. Dr. Drewski was handling the music - and he definitely did his thing. The Grungy Gentleman show celebrated New York City, and the fusion of contemporary culture and style, in sports, music, and entertainment, with Bronx-native hip-hop icon Jim Jones from Dipset opening the show, followed by Michael Beasley (NY Knicks), Tye Smith (Tennessee Titans) and Isaiah Pead, former NFL player who lost his leg in a car accident in 2016, who closed the show as guests cheered him on down the runway. DJ Drewski of Hot 97 spinned as guests arrived to the Dream Downtown, including notable guests: London Brown (HBO Ballers), Brett Gray (Netflix’s On My Block), Jerome Lamaar (Fashion Influencer), Neville Hewitt (NY Jets), Mani Love (Harlem Globetrotters), Madelyn Burke (SI’s The Crossover Host), Josh Boone (Former NBA / Brooklyn Nets). As guests enjoyed Gentleman Jack Rare Tennessee Whiskey cocktails before the show kicked off, the New York Institute of Beauty was busy prepping models backstage, while the athletes recorded their Cameos (cameo.com) for fans. After the show, attendees left with their Nivea gift bags and headed down to The Electric Room for the after-party to celebrate another successful Grungy Gentleman show. Grungy Gentleman seamlessly fuses contemporary culture and style, capturing the core of men’s interests in sports, music, entertainment, art and technology. Each piece from the collection looks to suit and inspire the man who is bold, intelligent, and passionate with fierce taste. The line boasts everything from blazers to crewnecks, pants, outerwear, and leisurely sportswear. The collection experiments with garment structure and texture. Design is clean and non-traditional, yet made cohesive through a neutral palette and with the brand’s trademark six-stripe design incorporated throughout. This collection celebrates New York and the crossover of fashion and sports with the debut of the Grungy Gentleman X New Era collection in partnership with the National Basketball Association (NBA) and Major League Baseball (MLB). 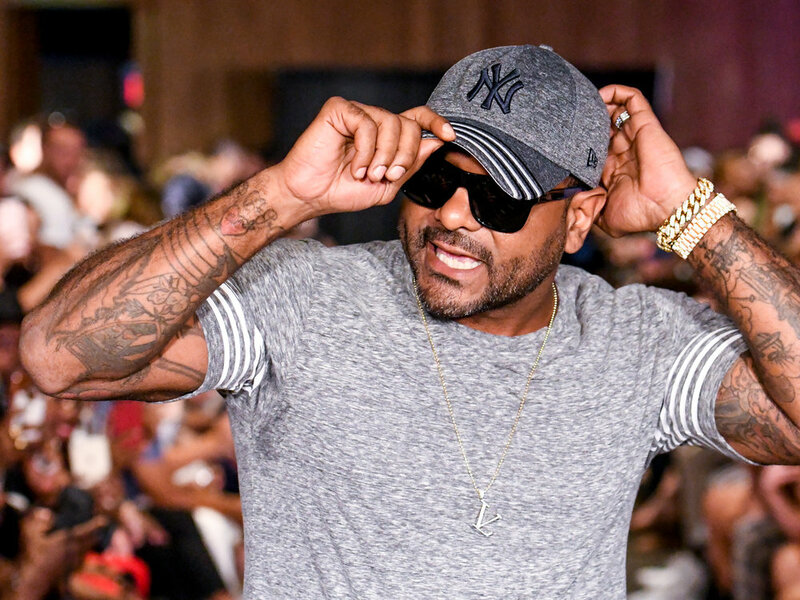 The show featured New York team hats (Yankees, Mets, Knicks and Nets) with models, including former NY Knick (free-agent) Michael Beasley and Bronx-native hip-hop icon Jim Jones from Dipset, ‘tipping their hats’ to their city. Video and Photos Courtesy of alioop | athlete mktg + mgmt.